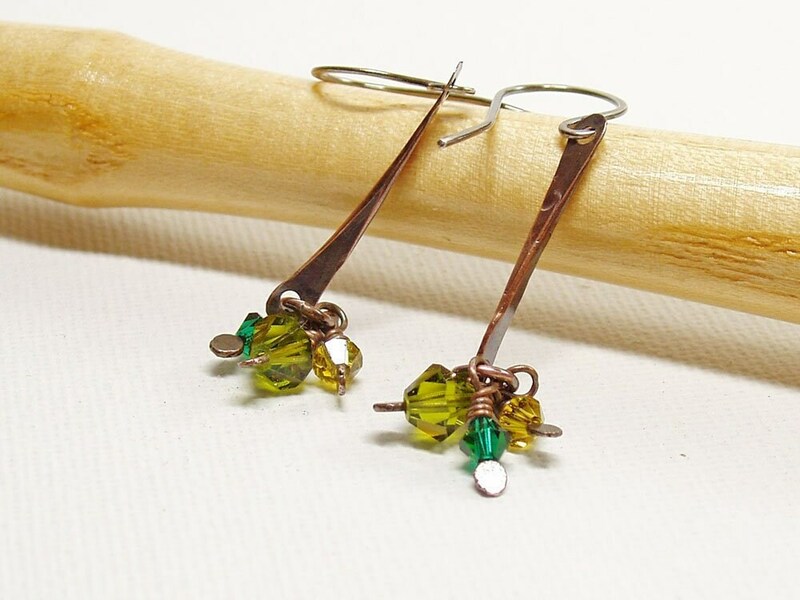 Crystal beads in three shades of green are suspended from hammered copper drop bars for a pair of earrings that are sparkly in a dark and mysterious fashion! 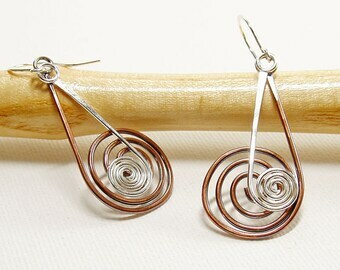 The handmade ear wires are sterling silver. 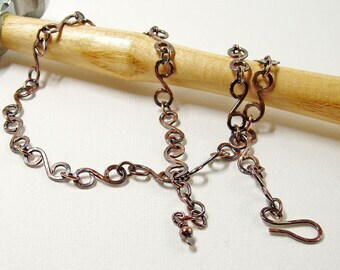 All the metal components have been oxidised and polished to bring up that soft brown sheen. 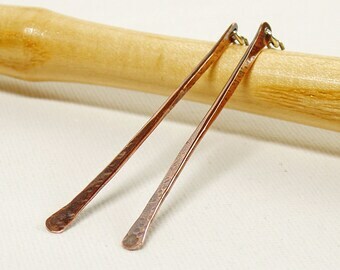 The patina has not been sealed, so coppery highlights will develop as you wear them, making these boho style earrings uniquely yours! 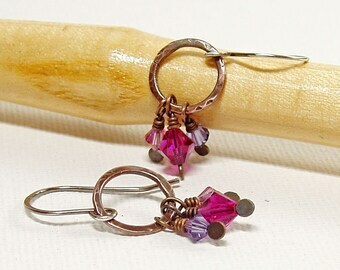 These romantic earrings are 2.25” (5.5cm) long, as measured from the top of the hooks. 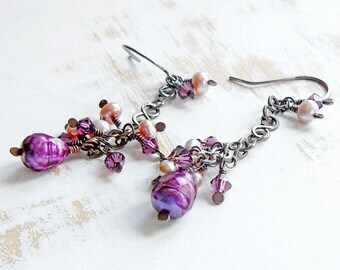 Everything (except the crystal beads) is handmade from copper and silver wire. 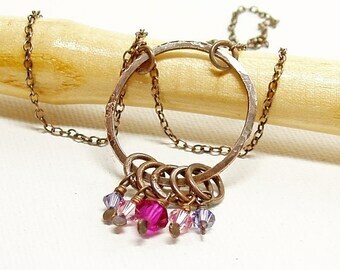 Purple Crystal Dangle Bracelet in Oxidised Copper, Dainty Bohemian Bracelet for Ladylike Ladies! 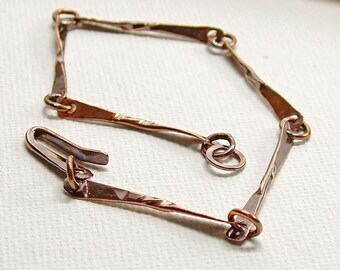 All items will be sent by Registered post, insured and with tracking. 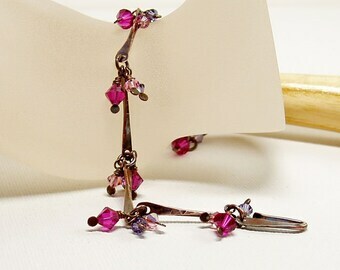 Earrings and bracelets are sent in gift pouches and necklaces in gift pouches or presentation boxes. All are packaged securely in acid free tissue paper, bubble wrap & a sturdy Jiffy bag. Please make sure that your shipping address is correct when you check out! I recommend you keep your jewellery in the storage bag provided, with the little black anti-tarnish tab, when you're not wearing it. I also enclose a polishing cloth with all shiny silver items. 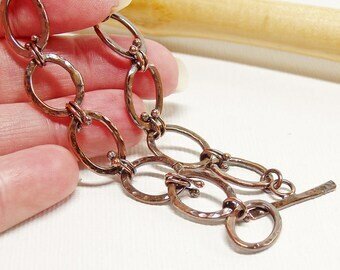 If your silver jewellery starts to oxidise, a gentle rub with this will bring back the shine. 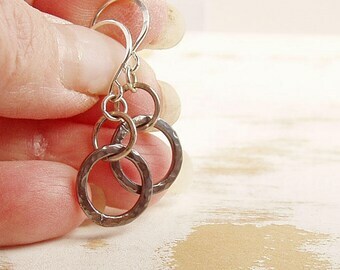 I apply a patina to some of my jewellery. I don't usually seal the finish. This means that the patina may change colour over time, depending on your body chemistry and atmospheric conditions where you live. Personally, I rather like these changes but, if you would like me to seal the patina in, I shall oblige! It may seem obvious, but please don't wear your jewellery in bed, in the shower, while swimming or hacking through the Amazonian Rainforest! 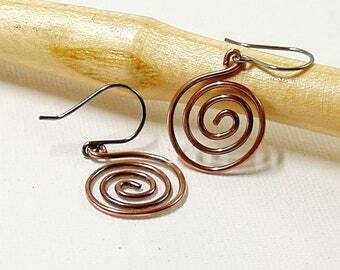 All copper earrings have oxidised sterling silver ear wires, to ensure the comfort of your ear lobes. 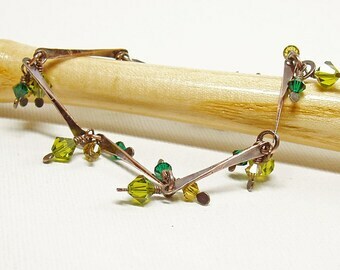 I can change most of my earring hooks to posts, if requested, and vice versa. Please don't hesitate to ask! 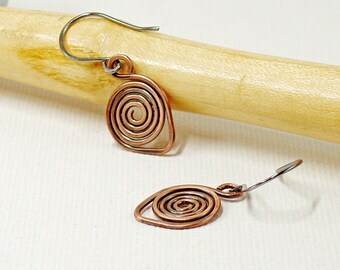 Just in case you were worried, my lovely earring model is made of paper! 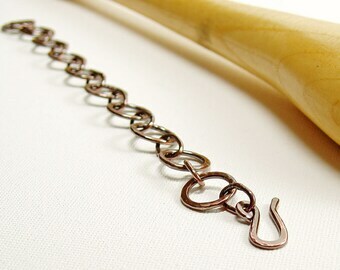 I have done my best with the photos and believe they reflect the true colours of my items. All monitors vary, however, and I cannot say for certain that they will look the same on yours as they do on mine.